It is easy enough to be friendly to one's friends. But to befriend the one who regards himself as your enemy is the quintessence of true religion. What difference does it make to the dead, the orphans and the homeless, whether the mad destruction is brought under the name of totalitarianism or the holy name of liberty or democracy? I worship God as Truth only. I have not yet found Him, but I am seeking after Him. I am prepared to sacrifice the things dearest to me in pursuit of this quest. Even if the sacrifice demanded my very life, I hope I may be prepared to give it. Civilization is the encouragement of differences. Civilization thus becomes a synonym of democracy. Force, violence, pressure, or compulsion with a view to conformity, is both uncivilized and undemocratic. 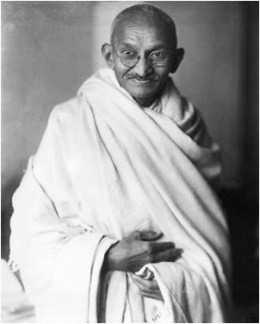 47 quotes by Mahatma Gandhi.